TSN Hockey Insider Darren Dreger reported Thursday that the Edmonton Oilers have opened discussions with the Philadelphia Flyers on a potential Cam Talbot trade. Dreger noted the talks are preliminary and added that the Oilers would have to receive a goaltender back in the deal. According to John Boruk of NBC Sports Philadelphia, the Flyers want that goaltender to be veteran Brian Elliott. Boruk reports the Flyers have no plans to re-sign Elliott, who carries a $2.75 million cap hit this season, when he becomes an unrestricted free agent in July. Dreger reported Friday, however, that Anthony Stolarz will be the likely return if the two sides can close a deal, but both teams remain in a holding pattern as of now. Oilers and Flyers in a holding pattern on Cam Talbot trade. As mentioned on Insider Trading last night, Anthony Stolarz likely in the return if they close the deal. RFA goalie end of the year. Dreger noted Thursday that moving Talbot could free the necessary cap space for the Oilers to activate defenceman Andrej Sekera from injured reserve. The Oilers need to clear $1.2 million in cap space for Sekera and trading Talbot for Elliott would free $1.4 million. Sekera has played in three rehab games with the AHL's Bakersfield Condors and TSN's Ryan Rishaug reports he will play the maximum of five games before being activated. He is scheduled to play in his fourth game Friday and could play in his fifth on Saturday. Elliott, like Sekera, is currently on long-term injured reserve, but was loaned to the AHL affiliate Lehigh Valley Phantoms on Tuesday to begin a "long-anticipated" conditioning stint. The 33-year-old has been out since Nov. 15 due to a lower-body injury. He has a 6-7 record this season with a .911 save percentage and a 2.59 goals-against average in 14 games. 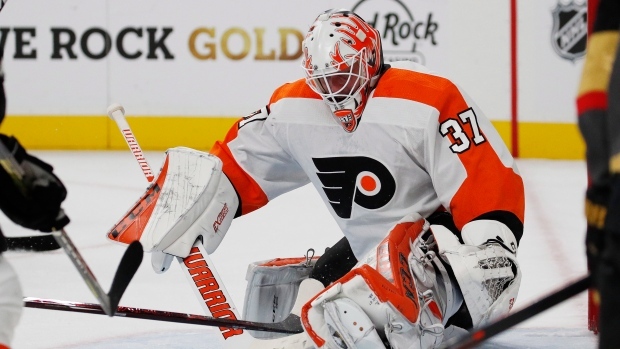 He is one of seven goaltenders to start a game for the Flyers this season, three of whom remain of the active roster – Carter Hart, Stolarz and Mike McKenna – while Michal Neuvirth is on injured reserve. Stolarz, 25, is 4-3-3 this season with a 3.33 GAA and a .902 save percentage. He carries a $761,250 cap hit this season and is scheduled to become a restricted free agent in July. Talbot has struggled so far this season, posting a 10-15-3 record with a goals-against average of 3.36 and a save percentage of .893. He carries a cap hit of $4.16 million this season and is also scheduled to become an unrestricted free agent on July 1. Dreger noted Thursday that Talbot and Flyers rookie starter Carter Hart have a "good relationship," meaning Philadelphia could be a good fit if the deal progresses. “He’s a good mentor, a great guy, a good goalie,” Hart said when asked about Talbot on Thursday. The Flyers rookie added he called Talbot for advice on the night before his first NHL start.